Texas Hold’em is the most popular version of poker in the world and is played using a standard 52 card deck. Every player gets two hole cards face-down. Then through four betting rounds a total of five community cards are dealt face-up on the table. Players must make the best five card hand with a combination of their hole cards and community cards. The player with the strongest hand wins. All Texas Hold’em games in GGNetwork are ‘No Limit’, which means there is no limit to the maximum a player can bet at once. Thus players can go all-in and bet all of their chips on their betting turn. The player on the left of the small blind. The big blind is the same as the minimum bet size. The player immediately left of the dealer has to post the small blind. Each hand has one designated dealer. 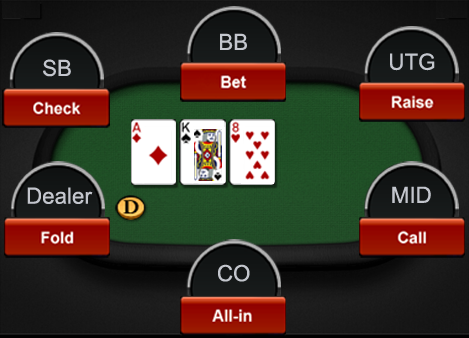 The dealer position determines the small and big blind positions. The dealer button is passed clockwise after every hand. There are four betting rounds in Texas Hold’em.